Bangle & leather bracelet | Agnès b. 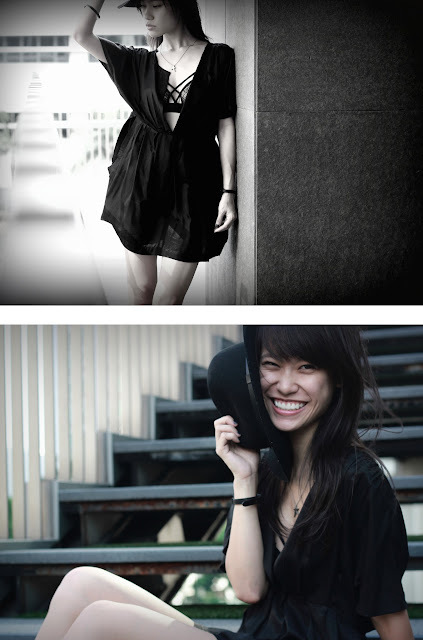 Went on a mini photoshoot with the super stylish and talented Leona (check out her blog and YouTube!) some time back in September 2014 and we took turns shooting each other, using a mix of her camera and mine. I was super excited about the shoot with her and had loads of fun that day! I've worn this dress a thousand times (okay, obviously that's an exaggeration, but really, I've worn it many many times) and I bought it when I was still in JC. That's 4-5 years ago! I still have many times in my closet which I bought in those days (mainly because I didn't grow much and they still fit me) - oh maybe that's why my closet is always on the verge of bursting oops. Anyhow, I've worn this dress many times (seriously) but this is probably the first time I've been photographed in it because previously when I wear it, I always wore it a boring way, like with a cami inside (because of the super low neckline). This time, I had took advantage of the pretty deserted shoot location and styled outfits which I wouldn't wear out walking on the streets of Sg usually. I'll probably get Stomped or something if I wore this outfit or my other outfit to Orchard Road lol. It's no secret that I love bralets and this one from ASOS fits me like a dream. To make it seem more appropriate for normal daily wear, I styled it under a sheer tank in this outfit some time back. But this time, I just felt that the straps on the bralet would show really nicely under this v-neck dress. (Okay, I think it's actually meant to be a tunic but I'm quite short so there we have it, a dress.) I really regret not having the time to iron the creases on the dress, though. The beautiful pleats would show better. These ASOS heels are not comfortable at all (to me). Probably doesn't suit the shape of my feet ohwell. It's the only pair of ASOS shoes that have let me down (comfort-wise) and after wearing it out once, I've made it a point to wear it for photoshoots only. Many thanks to Leona for shooting this!